Head of Iran's Judiciary, Sadegh Larijani (left), Iranian President Hassan Rouhani, and Speaker of Parliament Ali Larijani. August 14, 2018. Iranian media is buzzing over a photo taken of President Hassan Rouhani at a meeting with the heads of Iran’s legislative and judiciary branches August 14. Some say Rouhani looks angry in the photo, and commentators are taking turns speculating what might be the cause of his ire. 10- The picture was taken one day after Iran's Supreme Leader Ayatollah Ali Khamenei joined other Iranian hardliners to blame Iran's economic crisis on Rouhani and his cabinet's mismanagement. Khamenei admitted that sanctions were to blame "to some extent" but said "the main reason” for the sharp decline in the value of the Iranian currency (the rial) was the government's poor performance. He further blamed "the lack of prudence and timely measures" by the government as the main reason for Iran's ongoing economic crisis. Criticizing the mishandling of the foreign currency problem by the government, Khamenei said, "I am not saying this was an act of treason, but what happened marked serious mismanagement in policy-making and controlling the market." 9- On the same day, Khamenei strictly forbade any negotiation with the U.S. government, at least as long as President Trump is in office. This will have dashed Rouhani’s hopes of reviving his reputation as a diplomat. 8- A day earlier, Rouhani signed the Caspian convention in Kazakhstan with Russia's President Vladimir Putin, and their counterparts coming from Azerbaijan, Turkmenistan, and Kazakhstan. Right or wrong, Iranians believe that Rouhani has compromised Iran's rights and sovereignty by signing the convention. Iranians, particularly on social media, lambasted him, likening him to Qajar politicians who handed over large parts of Iranian territory to Russia in the Turkmenchai and Gulistan accords in the 19th century. Rouhani had promised before leaving Tehran that he was not going to sign anything. However, he signed the convention, saying Iran’s Parliament would put it to a vote. 7- On August 6 President Donald Trump ordered the implementation of the first phase of renewed U.S. sanctions against Iran and warned European companies that they would face penalties if they continued working with Iran. 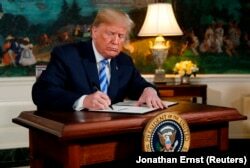 U.S. President Donald Trump signs a proclamation declaring his intention to withdraw from the JCPOA Iran nuclear agreement in the Diplomatic Room at the White House in Washington, U.S., May 8, 2018. Subsequently, many European companies still maintaining some sort of presence in Iran left the country despite EU promises to compensate their losses. Daimler, one of the companies that left Iran, said it had greater interests in the U.S. market than in Iran. 6- In a development just one step short of an impeachment, eighty members of the Iranian Parliament tabled a motion August 1 to question Rouhani about his administration's economic policy, which they believe has triggered the country’s economic crisis. 5- On 21 July Rouhani threatened that Iran might close the Strait of Hormuz and "many other straits" to prevent the flow of oil from the Persian Gulf if Trump's threat to reducing Iran's oil sale to zero materialized. While Rouhani expected no one would respond to his big talk, a July 22 Trump tweet in capital letters warned Iran not to "threaten the United States again or you will suffer consequences the likes of which few throughout history have ever suffered before." While Rouhani always accused his political rivals of dragging the country to the brink of war, now Rouhani has courting controversy with the world's most powerful military force. 4- After Trump offered July 30 to negotiate with Rouhani "without any preconditions," the Islamic Revolutionary Guards Corps (IRGC) again undermined Rouhani when its commander Mohammad Ali Jafar said July 31 that, "Iranians will not allow their leaders to negotiate with the United States." Earlier July 26, the IRGC's Qods Force Commander Qasem Soleimani directly addressed Trump in response to his threats against Rouhani, saying that he was the person to talk to about Iran's role in the Middle East, thereby undermining Rouhani and his foreign ministry before Rouhani made any move to weigh his possible response. 3- The Iranian economy showed the first signs of an abrupt collapse in February with rising prices and rapid devaluation of the Iranian currency. In March the rate of exchange for the U.S. dollar started an ever-increasing trend. In May the Rouhani administration attempted to impose an artificial rate which the market refused to recognize, and finally, in late July, the rate of exchange for the U.S. dollar hit a record high of 100,000 rials per dollar. Protest demonstrations shook the market in major cities while the price of household goods, food, and housing and travel nearly tripled within a couple of weeks. People started moving out of Tehran and other major cities hoping to find cheaper accommodation in small towns, but they still needed to pay for commuting to Tehran for work. Signs of collapse also emerged in the auto industry and aviation and tourism industries due to rising costs. 2- Rouhani's failure to stand by the promises he made in his election campaign started to hit him during the second term of his presidency. The most significant were his failure to put an end to the house arrest of former Prime Minister Mirhossein Mussavi and his wife Zahra Rahnavard, as well as former Parliament Speaker Mehdi Karroubi; and his inability to save the popular social networking platform Telegram from the clutches of hardliners who finally managed to ban it. Although over 30 million out of 40 million Iranians on Telegram still use the networking tool using anti-filter software, it is evident that he can no longer count on their support. 1-What started in Mashad on December 27, 2017 as a protest against high prices, appeared at first to be an organized mob engineered by Rouhani's political rivals in the hardline-dominated city, but soon it turned into a series of major anti-government demonstrations in over 100 Iranian cities. While sporadic protest demonstrations have taken place since then, at least two major waves of more widespread protests swiped across Iran in July and August. The government prefers to deny and control the demonstrations by portraying them as merely economically motivated mobs, but the slogans chanted by demonstrators target the government and its regional ambitions among other things.